Image Size: 24"w x 16"h.
The lively composition in this sunlit landscape starts your eye with the young girl’s face in the lower right, an autumn nymph whose joy in the late-harvest work party spreads throughout the painting. It’s even an olfactory feast for the farmer’s dog that lopes along, grateful for the rich unearthed scents and the children’s company as they make a game of gathering the final squash and pumpkin before winter yields a killing frost. 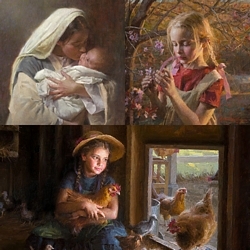 All three of Artist Morgan Weistling’s much-in-demand paintings sold at the 2012 Prix de West Exhibition and Sale this summer. Join the Weistling collectors by hanging this expression of thanksgiving in your home. Morgan Weistling began his artistic training on his father’s lap at 19 months of age, where he learned how to draw and more importantly, use his imagination. Capitalizing on his father’s talent for telling a story in comic strip form, Morgan began to develop a sense of narrative in his drawing. “It was here that art became a language for me.” At the age of 12, Morgan applied his interest in art to studying his father’s art books and began his art school studies at the Brandes Art Institute at 15. Working in a Los Angeles art supply store while attending art school, Morgan chanced to show his artwork to a prominent illustrator. As a result of their encounter, at the age of 19, Weistling found himself employed at a top movie poster agency in Hollywood. For the next 14 years, Morgan illustrated for every movie studio in Hollywood. His clients included Universal/Amblin Entertainment, Disney, MGM, Paramount, 20th Century Fox, Warner Brothers, Columbia Pictures and TriStar. In addition to movie posters, Weistling created all the cover artwork for the video series, McGee and Me for Focus on the Family and his art can be seen on numerous magazine, book, CD and video covers as well as Sega pinball machines. Since he has made fine art the focus of his art career, the collector demand for his originals has been overwhelming. With his masterful use of oils, Morgan Weistling brings a scene to life with spectacular lighting, creating a sense of wonder and engaging the viewer’s imagination and emotion. His dreamlike images touch the viewer’s heart, using more than sentimentality to engage the viewer. His canvases are filled with brushwork that tells a story beyond the subject matter. Like a skilled movie director, he manipulates the focus of interest with suggestions and impressions of forms that are barely realized and allow the viewer’s imagination to fill in the details. “There is a story underneath the story of my paintings,” Morgan adds, “I don’t hide the process of how I painted it. You can see the layers and count the strokes it took to get there. With some styles of painting, the closer you get to the canvas, the more you will see. With mine, the more you step back, the more detail you will see. That’s not easy, which is why it fascinates me.” Morgan Weistling follows in the footsteps of the masters he admires, John Singer Sargent, Anders Zorn and Nicolai Fechin as well as many others. In all of his vibrant work, from western art to feminine forms, Weistling crafts a narrative, driven by clarity, focus and purpose, drawing on images inspired by his beliefs and scenes from daily life. “My hope is that people will enjoy viewing my artwork as much I enjoyed painting it. For me, art is my language used to communicate to others how I see God’s creation. When I experience another artist’s work, I love to see through their eyes and find out as much about the artist as the subject they painted. That is what makes art so interesting.” Weistling, a highly sought-after teacher, conducts private workshops with juried students and teaches at the prestigious Scottsdale Artist School. Recent honors and awards include the Patron’s Choice Award and the Trustees Purchase Award at the Autry Museum of Western Heritage in Los Angeles, CA, the Prix de West Purchase Award at the National Cowboy and Western Heritage Museum in Oklahoma City, OK, and the Patron's Choice Award at the Autry Museum of Western Heritage. Weistling's book, The Image of Christ, was a finalist for the Evangelical Christian Publishers Association Gold Medallion Book Award. Weistling and his artist wife JoAnn, whom he met in art school, have been married for 14 years. Their 9 year-old daughter is often a model in Weistling’s paintings. They make their home in California.